One day, a couple of years ago, while trying to decide whether to produce a third album of his Dark Orchard experimental music, Jim Casson invited his great uncle Cecil Haist to the recording studio in the basement of his home. Casson knew that Haist, who was his grandfather’s brother and the last of his generation of the family, had some stories to tell. In particular, Casson wanted to know about the death of Haist’s first wife, Del. That song, called “Cecil & Del,” is the fourth track on Casson’s record, “Tres.” He released a video for it late last spring. As Casson slaps a syncopated beat in the background of ambient tones, Haist recounts the story of his wife’s death, and faded black and white photos of them fill the screen. There’s Del reclining on a lawn. There they are together, blurry on a beach. There’s Del sticking her tongue out with a camera in hand. Last February, when Casson started mixing the album, he thought he’d like to have Haist over to listen to the completed song. Not all of the new music is so heavy. Some of the songs emerged first as titled. Casson realized that the names of one of the greatest songwriting duos of all-time, The Beatles’ Lennon and McCartney, were strikingly familiar to “Lenin and McCarthy,” the Soviet bolshevik revolutionary and the rabidly anti-communist American senator. “It’s spoken word and ambient sound. Those guys are just yakking away in the background at the same time,” said Casson. Another song, “Bloor and Bathurst,” is a Christmas story. Other songs on the album use words from people he has met while touring. Casson typically plays two or three drumming gigs a week in southern Ontario, but has traveled across the country and in other parts of the world. “Donegal” is a song about the Troubles in Ireland. 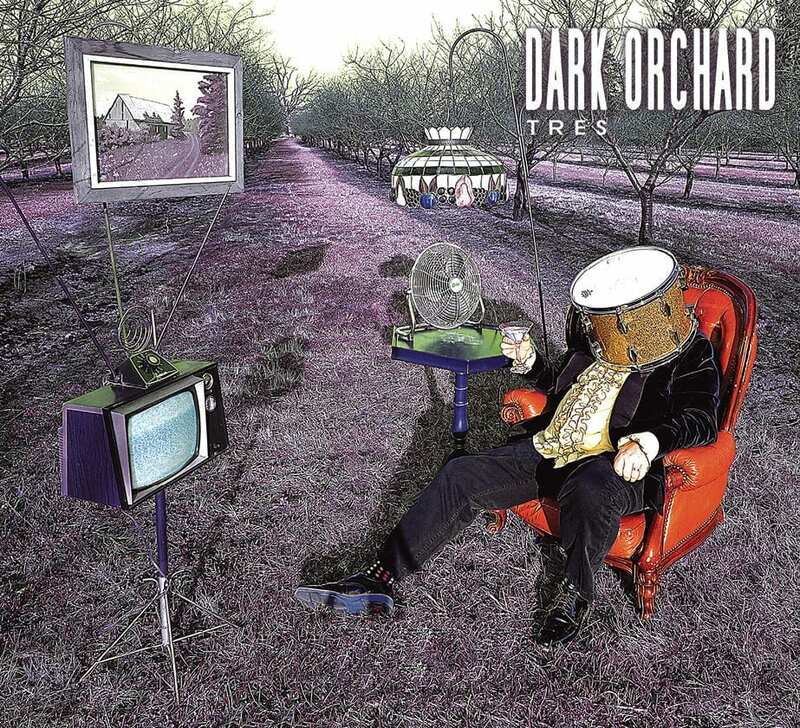 Songs from the previous two Dark Orchard albums were picked up and played on CBC’s The Signal, a now-discontinued evening show of often ethereal music. Not only is Dark Orchard a chance for him to play around with types of lyrics, Casson also makes use of obscure instruments. Casson hooked up the program on his computer to his drum kit, something he says he’s never heard done before. The end result, Casson said, is not only unmarketable, but also unperformable. But Casson, who is kept busy by his own gigging, farming the cherries on his land, his role in organizing the Fonthill Bandshell series, and in recording music for other artists, doesn’t mind. “I put the videos up online at darkorchard.ca, and I sell CDs at the Bandshell concerts,” he said. Even the cover of the album is reflective of Casson’s intentions with the project. On the cover of the second record, he used a forklift to bring a piano up into the cherry orchard behind his house. 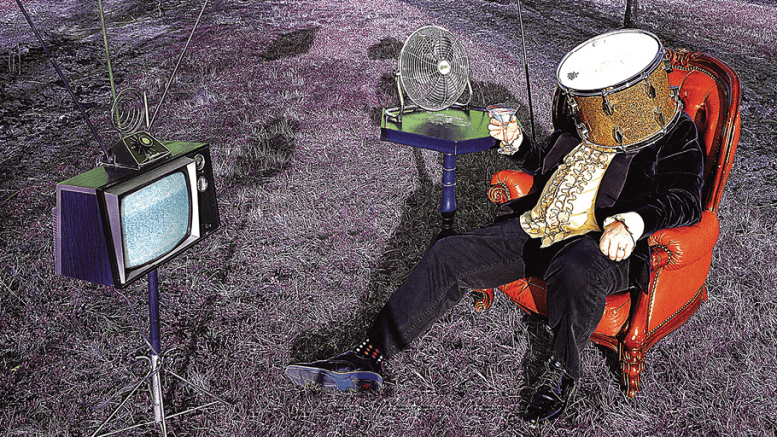 This time, he dressed up with a drum on his head and sat in a red leather armchair with an assemblage of oddities around him. Casson will perform live—and an entirely different genre of music— this Friday at Peter Piper’s Pub, in Fonthill. “Jimmy’s Juke Joint Blues” starts at 9 PM.